The World Subud Association organizes its finances in accordance with the ever-evolving, internationally accepted financial standards for non-profit organizations. The WSA is registered in the District of Columbia, U.S., as a non-profit corporation. Thus, we comply with both U.S. and Washington, D.C. regulations in how we solicit, invest and distribute money, and to whom we distribute it, and how we account for it. Funding International Helper visits, the archival, translation, and publication of Bapak’s talks are some of WSA’s top priorities. Download cover letter in Spanish, French. it has been 35 years this summer that I have been opened in the Wiesbaden group in Germany. In my time as an applicant when reading Bapak’s talks I didn’t understand him repeatedly saying we should be enterprising. Now, serving as treasurer for WSA, I finally can experience first-hand, why Bapak encouraged us to be enterprising. I see this in the broader sense of living an entrepreneurial spirit and making things happen. Bapak must have foreseen, that we would need the entrepreneurial spirit of individual members for the sustainability of Subud. Preparations for World Congress pick up speed. The World Congress Organizing Team is working diligently and the coordinator attends several congresses to include countries and individual members in the preparations. Therefore the expenses increased compared to our assumptions when budgeting last year. All other expenses are in their frame. Before the World Subud Council meeting starts next week in Freiburg, we publish the finance report On the first view you can see that the income from countries, individuals and enterprises is behind the amounts we expected. The gap between income and expenses is about USD 50,000. Do you remember we had a successful fundraising campaign due to a matching fund last year. This will be continued. Therefore one dollar you send to WSA, means two dollars to be able to carry Bapak’s mission to future generations. Did you ever ask for inner guidance about the significance of sending funds to the World Subud Association? Where do we spend the money for? We are spending our funds to carry on Bapak’s mission. International helpers are visiting groups and support members during zonal meetings in preparing themselves for World Congress. In the first half of 2017 they spent around USD 70,000 which is above the expenses at this time in the previous year. To preserve Bapak’s legacy and make the talks available to members up to now we spend less than by June last year. We didn’t yet send our contribution to Subud Publications International. The Human activities program is comparable with former years. Last year there has been an exemption because of a restricted donation which we forwarded to the Muhammad Subuh Foundation to spend on Subud houses. The expenses for the supporting services (USD 50,000) are also comparable with the previous year. This includes travels of the zone representatives, the chairs, and the executive team. Hope you can follow the preparations for World Congress through the newsletters and the new facebook side. The homepage should be ready by end of August and the registration is planned to open by October. Today we publish the WSA 2016 accounts Q3 statement of the activities of the World Subud Association in the first nine month of the current year. What did we spend your contributions on? The International Helpers continued visiting groups and supporting the work of the different entities of our organization. They report to us about their travels and we can see how well appreciated they are. Our expenditures for Kejiwaan Programs are almost USD 100,000 which is about last year’s expenses at this time of the year. During our Council meeting in Salobreña Spain in September, we tested again the importance and significance of the WSA Archive for the development of Subud. The budget reflects their significance. The expenses for the WSA Archive were lower than last year where the meeting of the archivists in Germany took place. The expenses for the other areas of the Media Unit are comparable. Differences are due to sooner or later payments. The human activity programs include the Care Support Program (Education Fund and Emergency Fund) and grants to zones. The Care Support Program already spent all money foreseen in the budget line. Grants to Zones were below last year’s expenses. In the beginning of 2016 we transferred an earmarked donation of almost USD 70,000 for Subud houses which had come in late last year. The total programs were about USD 205,000. This is almost the same like last year when we deduct the mentioned donation for the Subudhouses. For Supporting Services up to now, we paid under USD 100,000. We received the invoice for the World Subud Council meeting (about USD 27,000) in October. So it is not yet included in this statement. The expenses for zone representatives were less, as this year our two Africans brothers, unfortunately, did not receive a visa for Spain. For the majority of the executive team, the travel costs to Spain were lower than to Chile last year. Today we publish the statement of the activities of the World Subud Association in the first three months of the current year (Q1). In August we will be exactly at the midpoint of our term between Puebla World Congress and Freiburg World Congress. The World Congress Organizing Team started its work some weeks ago. What did we spend your contributions for in the first quarter of the year? What about a cup of coffee per week for Subud international? When was the last time you invited a friend for a cup of coffee? Yesterday, last week or last month? Would you invite a Subud brother or sister from abroad traveling through your country? I’am sure you would. So please think about the value of international Subud work for you and what you can personally afford. 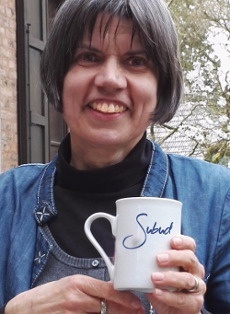 One cup of coffee per week for Subud, would that be possible? Or would you like to pay the coffee for others who can’t afford to do so? Imagine: if each member could support WSA with only one Dollar per week, the current expenses could be paid. The budget for 2016 has been approved by all zone representatives end of February. It includes about USD 499,000. Today we publish the statement of the activities of the World Subud Association in the first nine months of the current year (Q3). Comparing the current year with the past year we have to take into account that costs are different in a year of World Congress. What did we spend your contributions for? The international helpers, who have been in their role for more than a year now, are really diligent visiting groups and supporting the work of the different entities of our organization. During the World Subud Council meeting in Santiago de Chile in September, the international helpers together with the zone representatives gave the attendees an overview of the situation of our Subud groups in the entire world. Wonderful treasures so far – space for more! Read the letter in your language. Dear brothers and sisters, the first months of this year seemed to fly by us. In February/March, several meetings took place in Indonesia. The World Subud Association team felt it very important to meet Ibu Rahayu and our Indonesian brothers and sisters. In Bapak’s home country we have more than 50 percent of all Subud members. The visit also revealed that we have to work hard to strengthen the relationship with Subud Indonesia. Since all ZoneReps have approved the budget, we can now publish it. Our meetings with Ibu Rahayu and the exchange with several Council members and International Helpers confirmed that the budget sets the focus in the right way. Let me, first of all, underline that all units (international helpers as well as committee) serve the latihan and the growth of Subud. Let me thank the many many individual members who by their regular contributions enable the zones to send money to the World Subud Association for our international work. Subud Britain and Subud USA sent remarkable contributions. I also thank the donors and the enterprise who really helped us to finance 2014. But all of you, brothers and sisters, supported our work not only by worldly treasures but also by inner support. Note: The WSA annual accounts were audited by Ernst and Young accountants through 2009 and beginning in 2010 by Thomas Westcott Chartered Accountants in the UK. A WSA Finance Report covering the development of the finances during the term since the last world congress in 2005 until the end of the 3rd quarter 2009. For information purposes a 2009 pro forma consolidated balance sheet is presented of WSA and its related bodies (Muhammad Subuh Foundation, Susila Dharma International, Subud International Cultural Association, Subud International Health Association, Subud Publications International, Yayasan Muhammad Subuh and its affiliate Archives in Indonesia, Yayasan Subud and the Subud World Congress, Inc. in New Zealand). For MSF financial information visit www.msubuhfoundation.org or the MSF section of this site. Why does WSA need donations? WSA supports a wide range of activities and programmes worldwide, which have been described on this website. They include spiritual and financial support to new Subud countries, groups and members with a focus on developing countries, facilitating regional and international congresses and gatherings, preserving and publishing the talks of Bapak Muhammad Subuh Sumohadowidjojo, creating and maintaining communication and information platforms for Subud members and the general public, as well as participating in relevant international events and fora. The goals as set at World Congresses by the WSA member countries are translated into annual work programmes and budgets. We aim to have transparency in our accounting, with audited annual and unaudited quarterly financial reports being distributed to all WSA members and donors as well as being published here and on the www.subudworldnews.com website. All these programmes can only be carried out thanks to a large number o f honorary workers and to voluntary financial contributions. Who do we receive financial contributions from? The WSA member countries and the Muhammad Subuh Foundation are the largest contributors, but voluntary donations from individuals and enterprises, in average more than 1/3 of total contributions, are of critical importance for the WSA programmes. Any donation, no matter how big or small, helps WSA to achieve its goals. Give a General Donation that will be used according to priorities set by the WSA Executive and approved by the WSC. Three ways make a donaton to WSA: wire transfer, cheque/check or online; simple information may found in English, Español, Indonesian , Francais and Russian or visit the online donation area for additional information. Transparency and trust are fundamental to the relationship with our donors. Therefore we are committed to providing all donors with certain rights. That WSA provides member countries with amalgamated information on annual funding requirements of WSA and associated entities. That WSA provides information to Member Countries about the various models of ownership, good governance and uses of Subud premises worldwide, explaining their advantages and disadvantages. To avoid duplication of effort, WSA, together with MSF, will offer their expertise in accounting, investment, etc. for use by other WSA associated entities. You may read all the proposals from this working party.